This is a Stone Temple is on the banks of river Bharatapuzhai. This Kshetra is considered as holy as Kashi and Shraddhas in Kashi are performed here. This place was originally called "Tiru navayogi ( as nine yogis performed Yagna here) which in course of time became Itrunavai. This is the only temple in Malai Nadu (Kerala) where there is separate Sannadhi for Thayar(Lakshmi). The Moolavar is Naavaai Mukundan, Narayanan seen in standing posture facing east. On the other bank of the Bharathapuzai river, there are temples for Siva and Brahma. Devotees perform the annual rites for their ancestors at this sthalam. Nine yogis once performed yagam here and hence the place came to be called Thirunavayogi (nava-nine), which later became Thirunaavaai. This is one of the few temples in Kerala with separate sanadhi for Lakshmi. Mahalakshmi and an elephant were both worhsipping the Lord with the lotus flowers from a tank. At one time, the elephant could not find any flowers & he prayed to the Lord to show him a way. Lord Vishnu asked Lakshmi to be seated by his sie & the elephant now had enough flowers & happily worshipped the Lord along with Lakshmi. 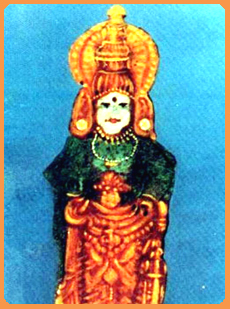 Thaayaar - Malarmangai Naachiyaar, Sirudevi. Nammalwar - 3634 - 3644. The Moolavar of this sthalam is Naavaay Mugundhan. Also named as "Narayanan". Moolavar is found in Nindra Thirukkolam facing his Thirumugham towards East direction. Prathyaksham for Lakshmi, Gajendran and Navayogis. This sthalam is situated 1 kms away from Edakkulam railway station in Kerala. We can also reach this sthalam by travelling through bus from Shoraanoor to Kuttipuram. This sthalam is a small village and as a result, there is no plenty of staying facility. This sthalam is found on the shore of Bharathappuzhi river which is found 1 kms away from Edakkulam along the south direction.